Our latest innovation for the control of Barbers Pole and Liver Fluke in Sheep. 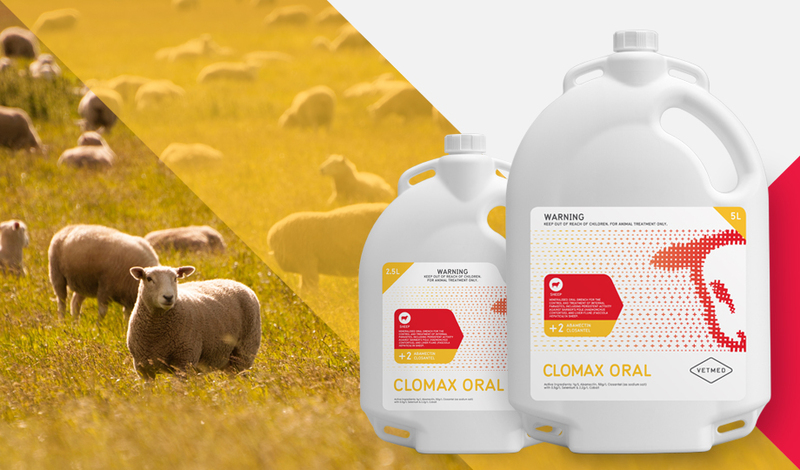 During the barbers pole season (typically February to April) we recommend using VETMED Clomax Oral which is a broad spectrum oral drench offering 42 days persistency against Haemonchus contortus (barbers pole worm) in sheep, as well as control of liver fluke. Pull out quote highlighting key points of the article, potentially containing hyperlink to further info. This is a very serious bloodsucking worm of sheep found to some extent for most of the year, but becoming most serious after extended dry periods, often in late summer and in autumn. Signs seen in sheep with severe Haemonchus infection are signs of anaemia (ie loss of blood). The Liver fluke parasite is a major cause of chronic wasting in both cattle and sheep in New Zealand. Infection can occur at any time during the year but is most prevalent during the spring and wet summers, with effects seen during the rest of the year. The immature stages of this parasite require an intermediate host to develop. In New Zealand, the main host is a snail called Lymnaea columella, which inhabits ponds and marshes and even on irrigated pasture. Stock ingest the immature parasite from forage, on which it can survive for over one year! Once in the animal, the immature fluke migrates through and feed off the liver, before developing into adult fluke in the bile ducts. This causes massive inflammation of the liver, with loss of blood and protein, resulting in production loss through ill-thrift, anaemia and anorexia. VETMED Clomax Oral is registered pursuant to the ACVM Act 1997, No A011291. See www.foodsafety.govt.nz for registration conditions.